In medicine we use checklists as aide memoirs because they help us to avoid errors of omission, especially in an emergency when we are stressed and less able to think logically. One that everyone learns if they do a First Aid course is A.B.C. and it stands for Airway, Breathing, Circulation. It is designed to remind us what to do first because everything that follows depends on it, and then what to do next, and so on. Avoiding the errors of omission improves outcomes. In the world of improvement we are interested in change-for-the-better and there are many models of change that we can use to remind us not to omit necessary steps. One of these is called the Six Steps model (or trans-theoretical model to use the academic title) and it is usually presented as a cycle starting with a state called pre-contemplation. 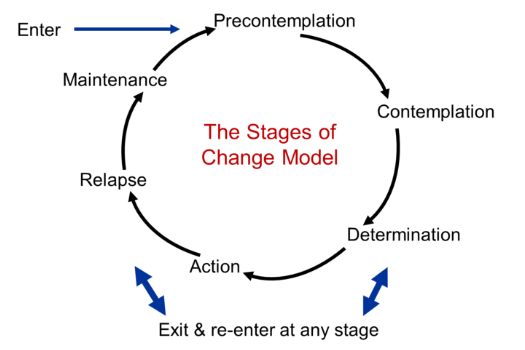 This change model arose from an empirical study of people who displayed addictive behaviours (e.g. smoking, drinking, drugs etc) and specifically, those who had overcome them without any professional assistance. The researchers compared the stories from the successful self-healers with the accepted dogma for the management of addictions, and they found something very interesting. The dogma advocated action, but the stories showed that there were some essential steps before action; steps that should not be omitted. Specifically, the contemplation and determination steps. If corrective actions were started too early then the success rate was low. When the pre-action steps were added the success rate went up … a lot! The first step is to raise awareness which facilitates a shift from pre-contemplation to contemplation. The second step is to provide information that gradually increases the pros for change and at the same time gradually decreases the cons for change. If those phases are managed skillfully then a tipping point is reached where the individual decides to make the change and moves themselves to the third step, the determination or planning phase. Patience and persistence is required. The contemplation phase can last a long time. It is the phase of exploration, evidence and explanation. It is preparing the ground for change and can be summed up in one word: Study. Often the trigger for determination (i.e. Plan) and then action (i.e. Do) is relatively small because when we are close to the tipping point it does not take much to nudge us to step across the line. First we raise awareness of the issue. Then we learn a solution is possible and that we can learn the know-how. Then we plan the work. Then we work the plan. Then we celebrate what worked and learn from what did and what did not. Experience shows that the process is not discrete and sequential and it cannot be project managed into defined time boxes. Instead, it is a continuum and the phases overlap and blend from one to the next in a more fluid and adaptive way. Raising awareness requires both empathy and courage because this issue is often treated as undiscussable, and even the idea of discussing it is undiscussable too. Taboo. But for effective change we need to grasp the nettle, explore the current reality, and start the conversation.